サットン郡の公共教育はソノラ市に本部を置くソノラ独立教育学区が管轄している。 Sutton County is served by the Sonora Independent School District based in Sonora. ^ Quickfacts.census.gov - Sutton County - accessed 2011-12-06. 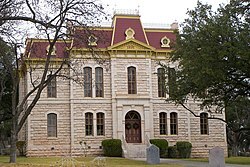 ^ American FactFinder - Sonora, Texas - accessed 2011-12-06.